2015-up Dodge Challenger Clear LED Front & Rear Side Markers Dodge Challenger Clear LED Side Markers, 15-UP Dodge Challenger Clear LED Side Markers, Challenger Clear LED Side Markers, Dodge Challenger LED Side Markers, Dodge Challenger Clear LED Side Marker Lights, 15-UP Dodge Challenger Clear LED Side Marker Light [Oracle 9860-019 LED Side Markers] - $169.95 : 3rd Strike Performance, Your Source for Late Model MOPAR Performance Parts and Accessories! Oracle SMD Concept side marker lights give your ride head-turning style. Fitted with high-powered 3528 Bridgelux surface mount diode LEDs, these side marker assemblies emit a laser-like glow that's brighter and more brilliant than the factory-lighting. Oracle Lighting SMD Concept side marker lights are offered with a choice of lens finishes and are painted to match your factory paint. 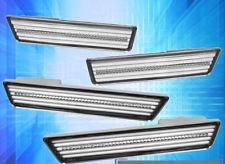 All it takes is a few minutes and three simple steps to install these SMD Concept lights for a great new look.